Hope Mill once stood on the edge of the village near the public entrance to Finchcocks House. Its water source was the River Teise which flows under the main road into Goudhurst, the A262, at that point. We don’t know exactly when the mill was built but an item in the Will of Richard Culpeper of Ardingly, son of Walter Culpeper of Bedgebury, dated 22 September 1516, mentions “To George Culpeper….. a mill called Hope Mill in Goudhurst……. and the halfendele of a fulling mill in Horsmonden”. The fulling mill was probably at Broadford, a couple of miles downstream, which was later in the hands of the Austens. Queen Elizabeth visited Broadford cloth mill in 1573 when she stayed the night of Friday August 7 with Mr Culpeper at Bedgebury, knighting him “Sir Alexander” four days later at Rye. Was Hope Mill a fulling mill at that period, or has it always been a corn mill? It appears on several maps of Kent in the 17th century and there was a dispute over the water rights in the time of Elizabeth. The Marriott property in 1715 included two watermills, Broadford mill and Hope Mill “both of which grind corn and Brazool for dyers”. Red dye was extracted from brazil wood. “To be let, and entered upon immediately, that exceedingly good and well accustomed mill known by the name of Hope Mill near Goudhurst, Kent. She was rebuilt within the Twelvemonth: grinds with four pairs of stones, and has fourteen acres of very rich meadow land adjoining to be let with her. For particulars apply to Brickwall House, Northiam: at Mr Ambrose Keble’s at Seal, or at The George at Lamberhurst”. In 1837 James Clemetson, who worked the windmill at Brenchley, rented it from Sir William Smith Marriott of Horsmonden Rectory on whose estate it then was. Clemetson went into partnership with John Slaughter the miller at Hope Mill, and Slaughter & Clemetson became the name of the firm. Later Slaughter retired and James Clemetson was joined by his son Edward, and the business continued as Clemetson & Son. Flood gates were installed in 1886 to control the flow of water and in 1913 the millrace, which formerly had been timbered, was replaced by concrete. The Mill was closed down during the 1914-18 war as it was not grinding the right sort of flour. After the war, when it was working again, it only produced wholemeal flour which was delivered around the district by the familiar horse and van. Full time milling ceased in 1925 and was abandoned in 1936. The last miller was Edward Clemetson, grandson of James, who died in 1945. In 1937 the machinery was sold. The corn kibbler and cake-cracker went to other mills and the iron machinery went for scrap iron. The two mill wheels, overshot and undershot, remained in position, but began to rot away. The interior of the mill became derelict. The millstones became ornaments in the mill house garden. In 1892 the railway line from Paddock Wood to Goudhurst was completed. The station was constructed on the opposite side of the A262 from Hope Mill and was named “Hope Mill for Goudhurst and Lamberhurst”. In 1893 the station was renamed simply “Goudhurst”. 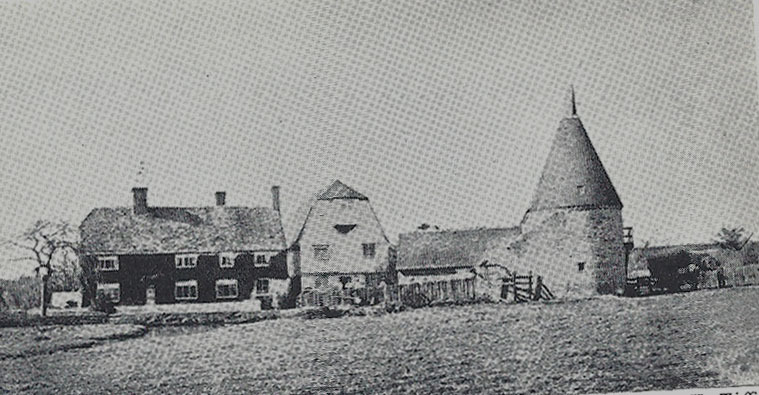 Hope Mill was sold in 1970 and was renovated to become a house and studio. It has continued to be a private dwelling house since that time.